Scotland's route 66, the NC500 has been named one of the most impressive roadtrips world wide and with good reason. The views span far and wide at every turn and it's hard to even imagine that you're still in the U.K.
As you travel along winding roads, you watch mountains meet the sea; lakes can be spotted miles away and the cold air, when you get out of the car, wherever you are, fills your lungs in a way only vast open spaces can. The route leaves you with a sense of accomplishment like no other trip I've been on before, because you truly have escaped into the wildness. I had been planning on doing the route for the past 2 years but timing had never allowed. Finally though, in October we packed up the car with all our camping gear and layers, and set off to the far north of Scotland. We decided to start our trip at Applecross, the opposite direction to how most people do the circuit and finished our trip in Killin. Although that did mean that we had a 6 hour drive to get there, it was so worth it. As we climbed the steep road over the top to Applecross, which is impossible to use in winter, our jaws may as well have been dragging on the floor. We were amazed, our eyes not knowing where to look and our excitement levels reached that of a 2 year old at Christmas. After a night in Applecross we headed North up the west coast to Ullapool for our first night of camping. At the last minute we changed our site and as we winded down one of the longest roads, with glorious views of a loch, mountains and valleys, I have never been so proud of a last minute change of plan. Our campsite was located in the valley by the loch and which ever direction you turned, a picture perfect view could be seen. As sunset closed in, we walked down to the loch and watched a seal bob about as the sun disappeared behind the mountains, the only noise was that of the water by our feet and the wind as it blew in from the coast. We had officially found tranquility in the UK. The next day saw us tackle a mountain, or for its technical name a Stac called Stac Pollaidh as we continued to move north. The weather had changed quite dramatically and as we were finishing our walk the wind reached that strength you wouldn't fall over even if you lean into it. After we got into the car the rain came down, heavy. We had planned to camp but the further north we got, the worse the weather and instead of attempting to pitch a tent in the cold and wet, we went knocking on B&B doors to find a bed for the night. Thankfully Hillside B&B had 1 room left and I have never been so relieved to be in the warm and away from the howling wind. The next day saw us journey along the top of Scotland, passing through John O Groats and ending at Ackergill Tower, our castle and accommodation for the night. As a stately home fan, I was exceptionally excited and the beauty of the place definitely lived up to expectations. After a 3 course meal and a sit by the fire, we eventually turned in for the night. Who'd have thought that so much fresh air would leave you so exhausted but it certainly had. Our next day saw us journey down to Durnock where we had booked in for a whisky tour at Balblair, one of the oldest and most northerly distilleries in the UK. The tour was great, from learning about the process, to the environment of tasting and our guide was great. After we finished, we then managed to squeeze in a quick trip to a waterfall on the other side of Durnock. After our quick stroll, we pitched our tent, cooked out tea and headed into the town to find a bar with a fire to spend our evening by. Naturally, we headed to what is known as one of the best whisky bars in Scotland, based in Durnock Castle. On our official last day of the route we started off at the most picturesque castle you ever will see, Dunrobin castle. We watched a falconry show in the rain, wandered the corridors of the stately home and I pretended I lived there, for a few seconds. We then set off on our long drive back down the country, stopping for lunch on the bank of Loch Ness and continued until we reached our final stop of the trip the Falls of Dochart Inn, next to, you guessed it, the Falls of Dochart which could be seen from our window. We arrived as it was going dark, after after been shown to our room, I hopped in the bath (it was a roll top, so it would have been rude not to). We then went down for dinner, eating in front of the giant open fire, and talking about our favourite moments of the trip. Finally, when I could barely keep my eyes open, we clambered back up to our room, and crawled into what I am convinced was the comfiest bed I've ever slept in and slept like a baby through till morning. As we travelled down the remainder of the country, through beautiful landscapes and pretty towns, and I finally completed my wild swim which was just as cold and as fun as I was expecting. The whole adventure made me realise just how lucky we are to have so many contrasting environments only hours away from where we live. Yes it may not be super hot and there maybe a chance of rain, but untamed beauty is not something many people get to truly experience in a world of all inclusive giant hotels and package holidays. 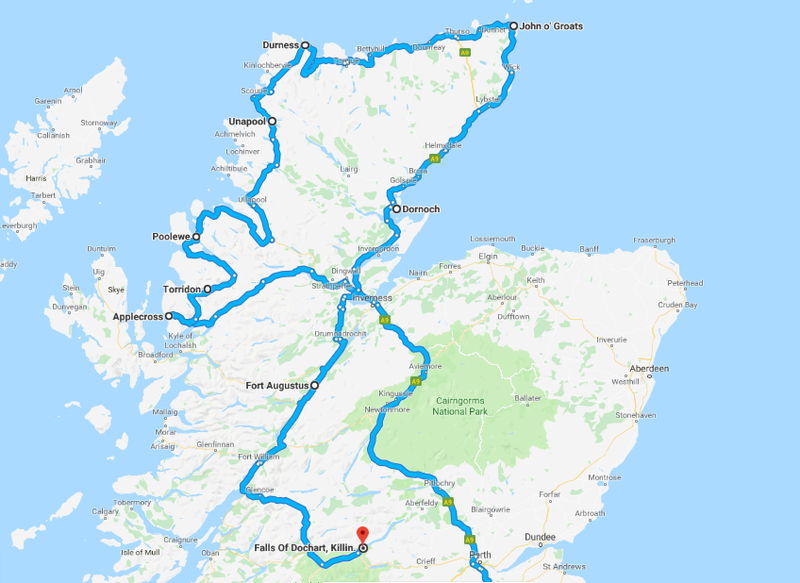 So next time you're thinking of where to go, bare in mind a Scottish adventure, you really wont regret it (I'm already planning when to go back). Have you ever been to Scotland? Where would you like to go? How have I only just heard of this road trip?! It looks incredible! I visited Edinburgh back in July and fell in love so would love to see more of Scotland!